Stadion Hostel offers cheap and comfortable accommodation in the unique surroundings of the Helsinki Olympic Stadium. The heart of the city and all the major attractions are easily accessible by foot or tram. The hostel is also ideally located for the Exhibition & Convention Centre, sports arenas and concert halls. The airport bus stop is within a 500 metre walk from us. You can also arrive by car as we have a free car park for guests. Most of our rooms are 9-12-bedded dormitories, but we also have a few smaller rooms in the hostel. All rooms have bunk beds. With the total of 166 beds, we can also accommodate groups. Rooms at Stadion Hostel have shared shower/toilet facilities. Our rates include bed linen and a towel. Buffet breakfast is available for 6.50 euro. We have 2 PCs with internet connection and WiFi in the Reception area, all free of charge to guests. You can swap experiences with fellow travellers in our TV lounge and cook delicious meals in the self-catering kitchen. Other facilities include a laundry room and a luggage room. All around the hostel, you can admire colourful wall paintings made recently by local art students. There are small lockers in nearly all of the dormitories but we also rent out lockers in the TV lounge. Public transport tickets, souvenirs, Helsinki cards, coffee and snacks are for sale at our 24-hour Reception. Our staff knows Helsinki and Finland well and are happy to help you with all the questions you may have. 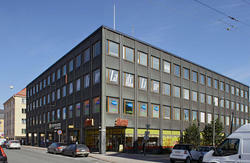 If you are looking for adventure and a relaxed international atmosphere, Stadion Hostel is the place for you. Stadion Hostel is dedicated to / invests in quality. 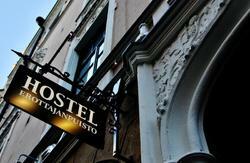 We were the first HI Quality certified hostel in Finland. 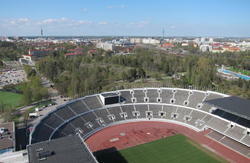 We are located right in the Olympic Stadium of Helsinki on it's northern curve. 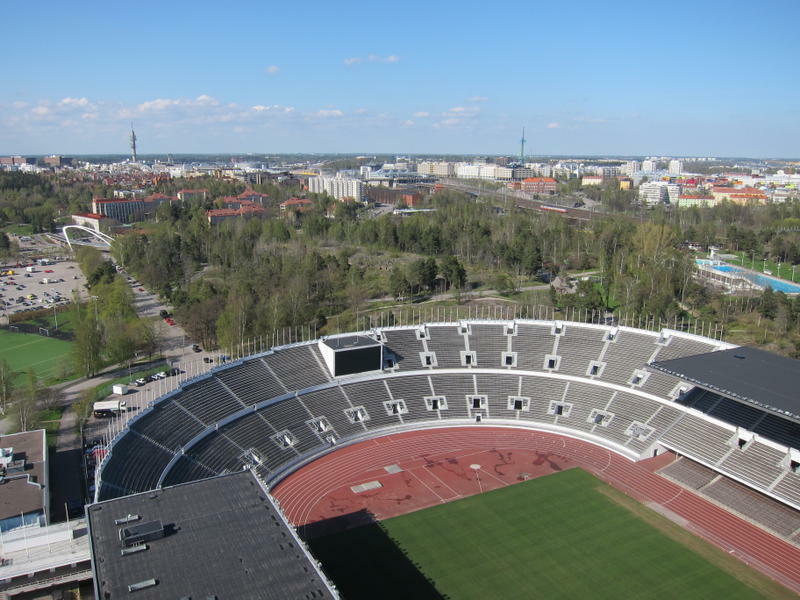 It is always easy to find us - the 72 meter high tower of the Olympic Stadium is visible almost anywhere in Helsinki. We are located 100 meters north from the tower. Our street address is Pohjoinen Stadiontie 4. Helsinki Airport (HEL) is located 18 kms from us. From the airport, you can take the Finnair bus to town, and ask the driver to drop you off by the Opera house, from where it is a 500 meter walk to our hostel. Helsinki Railway Station is located about 2,5 kms south of us. It is about 25 minutes walk from there to our hostel. You can also take a tram 2 in front of the railway station or trams 7A in Mannerheimintie. In both cases ask the driver to drop you off by the Aurora Hospital, from where it is a 200 meter walk to our hostel. If you arrive to Helsinki by Silja Line or Linda Line ferries, take the tram 2 (towards Tl or Elintarha), and ask the driver to drop you off by the Aurora Hospital, from where it is a 200 meter walk to our hostel. If you arrive to Helsinki by Viking Line, Nordic Jet Line or Sea Wind ferries, take the tram 4, and ask the driver drop you off by the 'Tln Halli', from where it is a 500 meter walk to our hostel. If you arrive to Helsinki by Tallink or Ecker Line ferries, take tram 9 to Kamppi metro station and change there for tram 2 (towards Tl or Elintarha), and ask the driver drop you off by the Opera House, from where it is a 500 meter walk to our hostel. For those who arrive with their own vehicles, we have plenty of free parking places on our courtyard. Bicycles can be stored in our garage.